Sticks to the surface so you can stick to high-quality results! Meguiar’s Wheel & Paint Iron Decon gives the professional the top-quality results that are expected from career detailers! 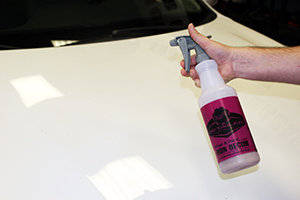 Meguiar’s Wheel & Paint Iron Decon is a versatile product that can be used both on paint AND wheels, saving you the time, money, and effort of having to get multiple products! The incredible gel formula of Meguiar’s Wheel & Paint Iron Decon will allow it to stick to the surface so it will have more time to work at breaking down and bonding with the iron particles on the surface. Meguiar’s Wheel & Paint Iron Decon has a pH balanced formula that is safe for use on any type of wheels or paint! Meguiar’s Wheel & Paint Iron Decon and its color-changing, fast-acting formula will show you just how much of a difference a professional-grade decontamination product can make! Most of the time, people who hire a professional detailer to detail their car are not the type of people that put in the time and effort to wash their car every week and take care of its condition. Which is great news for you, because you are now going to get paid for picking up their slack. However, when a car is treated with that level of neglect, fixing the problems that arise from the negligence can be quite a difficult task. Particularly when it comes to decontaminating the wheels and paint. By the time that car makes it around to your responsible hands, it is likely already in desperate and serious shape. What makes Meguiar’s Wheel & Paint Iron Decon unique is that its gel formula will stick to the surface. The longer a product rests on the surface, the better and longer it is able to work - it’s as simple as that! When you are facing jobs like this you need a product like Meguiar’s Wheel & Paint Iron Decon, a product that is capable of the impressive results that any job as serious as this requires. When it comes to removing iron particles from wheels and paint, Meguiar’s Wheel & Paint Iron Decon is as good as they come. It is the best, not simply because it is able to bond with the iron particles in your paint and pull them out, there are a lot of products that do that. Even though you need a heavy-hitting product in these situations, you still need to make sure that you leave the car looking better than it did before. There is not much use in you doing anything at all to the car if the products you are using end up corroding or discoloring the surface afterward. The main cause for problems like this is the level of acidity of the product you are using. Thanks to the pH balanced aspect of Meguiar’s Wheel & Paint Iron Decon, you will never have to worry about potentially causing any damage to the car that you are working on! 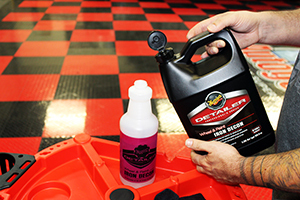 The cost of products is a huge factor in a successful detailing business. If you need to spend more money than you make, you’d be better off spending your time on your couch! Meguiar’s Wheel & Paint Iron Decon helps cut your product costs by combining two different products into one! This one product can be used to decontaminate BOTH your wheels AND your paint!